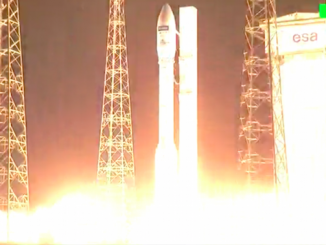 Firing off the launch pad with more than a half-million pounds of thrust, a Vega rocket soared into space Monday night from French Guiana with Europe’s Sentinel 2B environmental satellite. 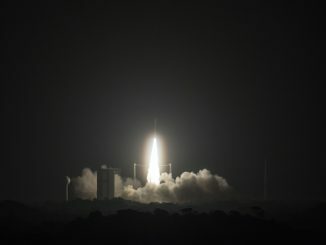 A European environmental satellite rode a solid-fueled Vega launcher from a tropical spaceport at the edge of the Amazon jungle into polar orbit Monday night, adding a new eye in the sky to check on the health of crops and forests from space. 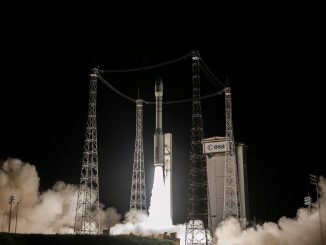 A Vega rocket launched from French Guiana at 0149:24 GMT Tuesday (8:49:24 p.m. EST Monday) with Europe’s fifth Sentinel environmental satellite. The Sentinel 2B observatory will take the pulse of Earth’s vegetation, monitoring crops, forests, urban sprawl, and pollution from polar orbit. 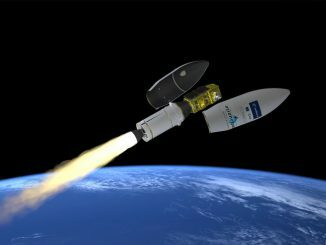 Europe’s fifth Sentinel Earth observation satellite will ride a four-stage Vega rocket into polar orbit 488 miles above Earth to begin tracking changes in agriculture and forestry patterns and monitoring natural disasters. 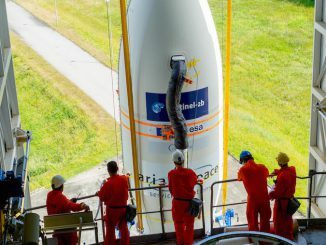 Ground crews have mounted the fully-fueled Sentinel 2B spacecraft, the next mission in Europe’s multibillion-dollar Copernicus Earth observation satellite fleet, on top of a Vega rocket inside a protective gantry on its launch pad in French Guiana for blastoff next month.